This section describes how to generate hash to mine Ether with ethereumfaucet.info. 1. Go to ethereumfaucet.info Website. 2. Enter my Ethereum account address, 0xef6Ea9F8Bd78ac42Fb2617ba90846D5785BB320c, in the address input box. 3. Click "I'm not a robot" to finish the CAPTCHA challenges. And click "Continue". I see the confirmation message: "You have claimed 1500gwei!" 4. Scroll down to find the MINING CONSOLE. 5. 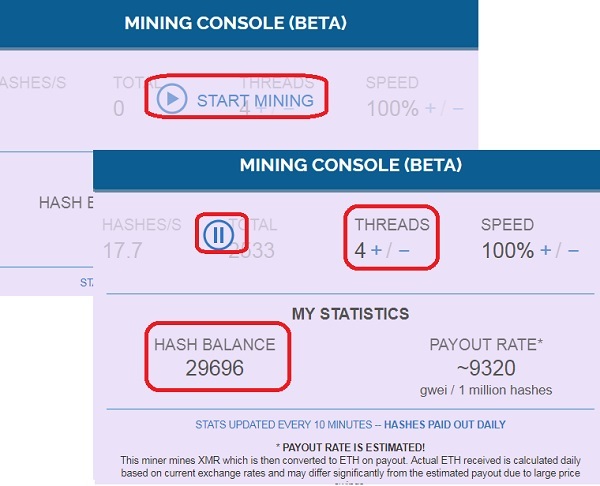 Click "START MINING" on the MINING CONSOLE. I see my browser starts to generate hashes. HASHES/S: 17.7 - Hashrate, number of hashes per second. TOTAL: 2533 - Number of hashes generates this session. THREADS: 4 - Number of threads used by miner. Can be changed. Good. I am contributing my computer resource to the Ethereum network through ethereumfaucet.info. And hopefully, I will get rewarded with some Ethers!